This can be stored in an airtight container for up to 5 days. Preheat oven to 250°F (120°C). Spray two 9 x 13 inch (23 x 33 cm) baking pans with non-stick cooking spray. Divide the popcorn between the pans. In a medium saucepan, over medium heat, combine sugars, butter and corn syrup. Bring mixture to a full boil, stirring occasionally. Reduce temperature to medium low and continue cooking without stirring until a candy thermometer displays 234°F (112°C). Remove from heat. Stir in vanilla and baking soda. Be careful when you do this, as the mixture will bubble vigorously. Pour the caramel mixture over the popcorn. Sprinkle chocolate chips, flaxseed and almonds over the popcorn. Stir to coat the popcorn. Bake for 45 minutes, stirring the popcorn mixture every 15 minutes. 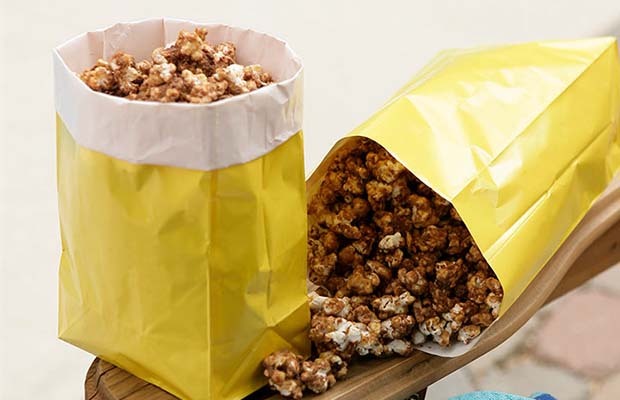 Remove from oven and transfer the popcorn to wax paper. Cool completely. Yield: 20 cups (5 L). Serving Size: 3/4 cup (175 mL). Each serving contains 1 tsp (5 mL) of flax.